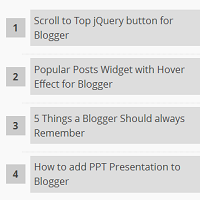 Previously I have posted a tutorial showing how you can add Popular Posts Widget with Hover Effect for Blogger. Today I am going to show how you can add a different style of Popular Posts widget for your blogger blog. This too has Hover effect in it like the previous one. Currently images and snippets are not supported in this widget and will make your widget look ugly so it is highly recommended to keep Thumbnails and Snippet of your off. Well when it comes to demo, you can see the widget live on our blog. The widget demo can be seen on the right sidebar of our blog. Go to Blog Title → Layout → Add a Gadget → Popular Posts. Be sure that you have unchecked image thumbnail and snippet box. After adding the widget Save the Template. After adding the code save your template. Your are done now. Now you and your visitors can see this cool Popular Post widget on your blog. let me know about your design. awsm widget ......... can you tell which template u r using nd ..it's links plzzz ..
To remove you and can remove Popular Posts widget from blog layout or just delete this added code.